Logan Burke is a burly young man but he admits to a moment of fear when he jumped out of bed to grab the intruder who had just woken him up. "I found the perfect moment to jump up and pin him against the wall," Burke, 19, said "It was pretty scary to be honest that little effort." He was relieved to find the intruder did not have a weapon. The tale of how Burke and the two other Kiwi tradies he shares an apartment with in Australia apprehended a burglar in their Perth home has received widespread coverage across the Tasman in the past few days. Many of the reports have suggested the burglar picked the wrong apartment to break into. 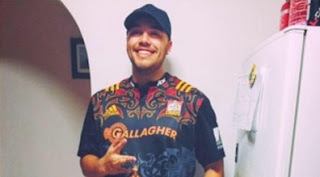 Burke, who is from Te Awamutu in Waikato and stands 1.93 metres tall, was woken around 2am by the intruder going through the bedside table next to his head. "He just had my hat and my watch on...He had the torch in his mouth also. It was kind of shining in my face." That was when Burke decided to wait for the right moment, which presented itself as the intruder walked around the end of the bed. "When I pinned him up against the wall I wasn't expecting him to throw punches." But that's what happened and Burke was hit by two glancing blows. "That's when I pushed him off and started to throw a punch myself," Burke said. He also yelled out to the "boys" - 20-year-old twins Dylan and Tyran Davis, from Waipu in Northland, who he lives with. Together the three dragged the intruder from Burke's bedroom to the dining room but it wasn't easy going. "He was a real strong bloke," Burke said. "All three of us were trying to grab him and he was still trying to get out." The intruder kept throwing punches. "He grabbed a bottle that was on the bench and tried to swing it at my mate...It was just nuts," Burke said. "He smashed a big jar on the ground." The three housemates tried to keep the intruder in a chair until the police arrived. They gave the intruder, who said he was asthmatic, a drink and some water to clean the blood off his face. While the intruder was caught, some of Burke's property remains missing. He has been unable to find a bag, his wallet, some jerseys and other property, while Tyran's phone is missing. The housemates searched around the apartment complex where they live in the seaside suburb of Scarborough in case their belongings had been stashed somewhere, but without success. Burke said they were also wondering whether the intruder may have had an accomplice. A man has been charged with burglary and assault following the break-in, while police ruled the three Kiwis had used reasonable force to stop the intruder.